This motion control system is stand-alone or externally controlled, easy-to-use, plug-and-play and cost effective solution for motion control applications. 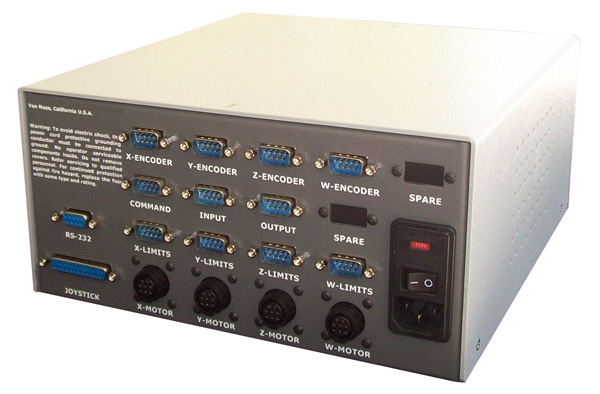 Each system includes the power supplies, controller, the servo motor drivers. In this mode, the controller does not need an external device such as a PC to operate. The controller is programmed in a simple programming language. The code is developed, downloaded to the controller, run and saved in the controller's non-volatile memory using the supplied Integrated Development Environment (IDE) software. This series is also available in 19" rack mount enclousure. These systems are suitable for all motors, actuators and stages.